READING CHALLENGE 2009: The A-Z Challenge! Leave a Comment on READING CHALLENGE 2009: The A-Z Challenge! 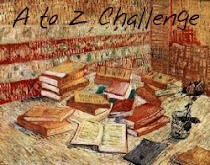 I’m taking part in this A-Z reading challenge. It started in January, but I am still going to try it – more so that I can get in practice for next year. I won’t make lots of different posts, which means I’ll keep coming back here to add my books read. Option A: Read authors A to Z. Commit to reading 26 books theoretically speaking. Option B: Read titles A to Z. Commit to reading 26 books theoretically speaking. Option E: Read 26 Alphabet books. Embrace your inner child and go visit the children’s section! Mention in your comment which option(s) you’ll be committing to. Sign ups begin December 1, 2008. (The challenge does NOT start until January 1, 2009, but early sign ups are definitely encouraged!) The challenge closes to new participants on June 30, 2009. The full rules can be read here.